William E. Backes (Bill) has 30 years of experience in the financial services industry and has practiced portfolio management and estate planning in Arizona since 1983. In addition to being a Certified Estate Planner, he holds the following securities registrations: Series 7 & 63 – General Securities, Series 65 – Registered Investment Advisor, Series 24 – Registered Principal, through LPL Financial. Bill is also licensed through the state of Arizona for life, accident/health, disability, fixed and variable annuities and property and casualty insurance. Watermark’s independence enables Bill to establish working relationships with a number of industry leading financial service firms and insurance providers. 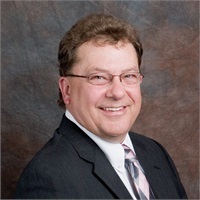 Bill leverages their products to create customized portfolios; however, he only recommends those products and services that are specifically tailored to suit his clients’ unique needs and circumstances. He prides himself on representing his clients, not the products. In addition to his professional achievements, Bill enjoys the outdoors and spending time with his wife Cindy, their three children Jason, Amy and Corie and his granddaughter Alex. He has been involved in Kiwanis, has served on the Board of Directors and Ethics Committee for Hospice and has also served as a church treasurer for years. In his down time, Bill is an avid fisherman and enjoys four-wheeling on his UTV.